I often cite the phrase “WINTER IS FOR WINNERS!” It’s not meant to be derogatory in any way, it’s not me calling anyone out, that doesn’t train through winter. However, I firmly believe if you set goals for the spring and summer, that process needs to begin when the clocks go back, it really takes serious motivation, focus and commitment to train through the winter months. It’s no coincidence that mood can be directly impacted, quite negatively during the colder, darker months, predominantly because, well it is cold and dark and as a consequence the mind has a tremendous part to play in how we respond to the change in seasons and of course our mood. This isn’t intended to be another post about mental health, because I’ve done that a few times, but it’s very hard to not link the benefit of exercise and getting outdoors to an improvement in your mental health. After all, I’ve been there. However, with the loom of a New Year, for many it's always a ‘benchmark’ opportunity to start anew. Being better people starts with our health and well-being. I’m of the opinion that you get those two things right, invariably most other things fall ‘happily’ in to place. If you’re happy in body and mind, then generally most situations can be made better, firstly you become more confident in the way you feel and secondly the decisions you make. Making that change though especially if it is necessary, is always the hardest step, ultimately you need to strip yourself bare and come to terms with the notion, that you need or MORE importantly want to make that change in the first place. That takes courage, but if you can take that first step, the rest although not easy, is easier. Going back to my opening paragraph, if you can start, when the clocks go back, believe me it doesn’t take long for that change you make to become habit, with habit comes discipline and with discipline comes results, and if you’ve started before winter has really even set in, imagine where you’ll be when the New Year ushers in. But first we have to start. It doesn’t matter you’re starting point, what matters is that you do start, but first to make that change work, you must find something to focus on. Give the hard work meaning, if it means something to you, you will stick with it, if you half-arse it, you will go at it like an arse. There is where I come back to finding your passion, what is it that takes your stresses away? What are those goals you’ve always wanted to achieve? What is it, that you’ve always thought, I want to have a go at that? What is it that really drives you? What would make you get up in the morning, ready to take on anything the world throws at you? Find your passion, once you’ve figured out what it is, fuel it! We all have a fire in our belly, for some it may lay dormant, considered spent in our youth, but the truth is, that fire never really goes out, not if we have the courage to stokes the embers, that dimly glow. Give those embers a prod and you will soon breath life into them. I don’t believe it is acceptable to grow old gracefully, it is no longer the accepted norm, that we must develop that middle aged spread, begin to wear sensible shoes, start to wear beige and accept the fact we’re getting old. Sure, that may be true, but we only become old when we start succumbing to the idea. Me, I plan to continue for as long as I can, aiming to get into the best shape of my life and stay there! Don’t get me wrong at nearly 47 years of age, trying to stay in decent shape, work and be a good dad and husband is hard work and takes some serious juggling, but I would sooner juggle whilst I’m able than not have the choice or indeed, believe it’s not a choice. You always have a choice and that choice should always be, do what you can and do what makes you happy, for you and those around you. I’ve always been active, whether that be running, playing football or any outdoorsy type pursuit, I had a few years where those embers were nothing more than a comforting warmth in my gut, which did nothing for me, except make that gut bigger. The spark as you all know was losing Lloydy, and whilst I would give anything to have him back, it was the catalyst for kicking my sizeable arse back in to shape! So whilst I always had a passion, losing Lloydy very much became the fuel I needed to reignite it. I still use Lloydy’s example to fuel my push towards the goals I want to achieve, probably in the vain hope, that come the day of reckoning, he will greet me in the same way, he always did before he was taken. I don’t want to disappoint him and whilst I know deep down, that couldn’t be the case, it’s still fuel to always be better. Not just for me, but for my family who deserve the best of me, and for his memory. I’m not suggesting you only find your fuel in loss, but there must be something in your life (unless you’re very lucky) that has hurt you, that you are able to use to spark those embers in to the most brilliant flame! Use negativity and turn it in to positive energy, that’s your fuel. Then begin working, work hard to achieve the goals, that passion you have sets you on the path of. I’m not promising it’ll be easy, but I promise it will be worth it, hard work is hard, but it works! Over the course of the last year I’ve set myself some pretty serious goals, the biggest, aiming to break 3hrs at some point in the very near future over the marathon distance, the initial aim being to get sub 3:05 to qualify for New York City as my final Abbott World Marathon Major. I also want a PB at what is likely to be my last ever Paras’10 and by PB I mean smash my previous best time of 1:40. Add to that I also have set my sights on the Marathon des Sables, now I know to do these things, sacrifices need to be made, predominantly because they can impact massively both financially and emotionally on my family. The time taken in preparation to target my goals, to keep me on course, can sometimes impact on family life. I try where possible to limit that, but find that even when I’m not training, I’m thinking about my training. I had originally wanted to do Tokyo and New York this year (2019) and get the MdS done in 2020, but with a change in plan to aim now to complete the SIX in 2020, it really means that MdS given the cost of how much it is to take part and the preparation, has to wait until 2021 at the earliest. I know I can’t continue to put myself under so much pressure to ready myself for lots of events (or even the charity aspect of it), and although I aim to keep my fitness levels up to a point where I’m able to deliver at any given event or challenge, I will focus on less events going forward. That approach needs to be adopted because although training through the winter, adds resilience, it leaves you susceptible to illness. That’s kind of been proven through this year and if truth be told I haven’t recovered yet from a chest infection I picked up mid-December and whilst I may spout Winter is for Winners, training hard through the cold, dark, wet months will play havoc with your immune system, if you don’t look after yourself properly. I’ve undoubtedly brought that upon myself this year, with the aim of taking on Tokyo/Brighton/London & MK Marathons and The Paras’10 in a very short time frame, but I did so, for what seemed, I reasoned at the time, a good idea. With taking a charity place at The London Marathon supporting The Royal British Legion, I decided that, the more I could throw in the mix, the greater my focus would be. Originally, the plan was to just do Tokyo and Brighton, and Brighton because it fell on what would have been Lloydy’s 40th birthday. I never really intended to do London after getting the usual ballot rejection, but a charity place is always hard to turn down, especially when it arrived via The Royal British Legion. We live and learn, and after all, what doesn’t kill us, only makes us stronger, right!? The goals are still the same as they were when I first wrote them down back in June last year, but with my desire to complete the Abbott World Marathon Majors and at some point the MdS, I have to think about the impact that it has, not just financially on my family, but with the time I have to invest in myself to realise those dreams. Those dreams aren’t going anywhere, but the timescale for realising them will be stretched, plus it’s really important to me to try and continue to grow The 100 Peaks legacy with Be A Black Sheep with my own events, so something has to give. To be the best version of myself, I have to be, as I’ve alluded to, be the best husband and father I can be, as well as the best possible version of my physical self. It’s now less than 5 weeks until The Tokyo Marathon, in fact (at the time of writing), it’s 4 weeks until I fly out to Tokyo. Tokyo will be World Marathon Major No.5, it’s incredible to think when I first started out on this journey that somehow I’d end up here. I only have one person to thank for that, and that’s my incredible wife, without who, none of what I’ve achieved in the last few years would have been possible. Once I get back from Tokyo, it’s then a few weeks before Brighton Marathon, then 2 weeks later London Marathon for the 4th time since 2014 and MK Marathon, 8 days later. Before spring is officially done with what will be my last effort at the Paras’10 on 18th May. If you’re reading this, thank you! Remember all men (and women) dream, but not equally, dream big, and have the courage and conviction to follow it. Next time I will go back to the opening image of this blog post, it’s been 3 years now since I first became an OS #GetOutside Champion, and very soon we’ll all be meeting up again, which I can’t wait for. I shall spend some time reflecting on those 3 years and the adventures to come for the year ahead! 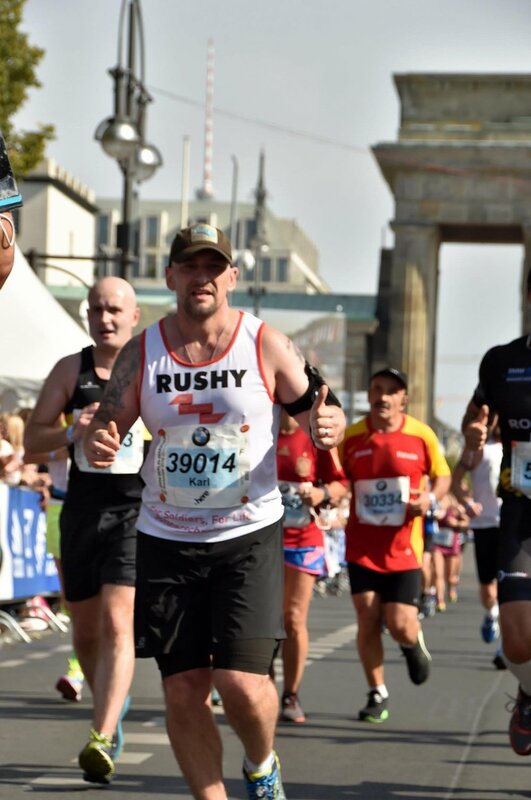 In the meantime, thank you for the support and if you can donate to an share my London Marathon JustGiving Page in support of The Royal British Legion, I will be forever grateful. There will be an raffle/auction to go towards my fundraising effort, details of how you can be part of that will also been in the next post.